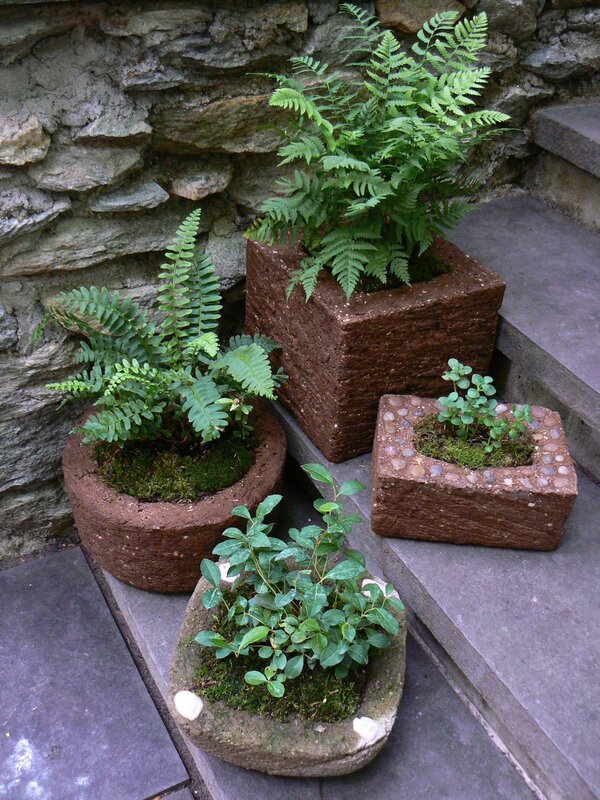 Hypertufa is a lightweight, all-weather material made from a mixture of Portland cement, perlite, and peat moss. After it is cast, it is textured to look like weathered stone. We make our hypertufa troughs, pots, and birdbaths right at the nursery. Each piece is unique. We make planters in a variety of sizes, shapes, and colors and embed stones, pottery shards, sea glass, and shells in them. Others have impressions of ferns and leaves pressed into them. You can purchase a pot already planted up or buy an unplanted one and choose a plant for it. The planters can remain outdoors through the winter. Attract birds to your garden with a hypertufa birdbath. Each birdbath is a unique design.